Who’s looking promising after the Jerez Moto3 test? The third official Moto3 test from Jerez finished last week, with overall three dry days of testing and one washout on the second day. This was the third time which wheels have been turned in the class at an official event, this year. At the end of the 4 days, it was Luis Salom, now riding on the Red Bull KTM who came out on top, and surprise-surprise, Maverick Viñales who was second on the time sheets, just over 2 tenths behind. Rounding out the top 5 were then Alex Rins, Alex (junior) Márquez, and Jonas Folger. You can find the day four test report here. Ignoring the fact that it’s testing, results shouldn’t be getting anyone too excited, or down in the dumps for that matter, we can hazard a guess as to which riders could ‘come of age’ during the 2013 season, perhaps gaining podiums and top 5 results throughout the year. At the beginning of last year, the name on the tip of most people’s tongues for the Moto3 title, was Viñales; he shone in the 125’s the year before, as his ‘settling in’ year, thus it was only natural that people expected him to white wash the competition, in 2012. Five wins in the first nine races looked promising, however, we all know how that prediction turned out, don’t we, Mr. Cortese. In PaddockChatter’s opinion, if there were ever to be an ‘easy’ year for Viñales to take the title, that was it. But the Spaniard seems similarly at home on his new KTM than he did last year on the FTR-Honda. He put in the fastest time on day 3, though ended up throwing it at the scenery, causing an injury to his right hand, in the process; Viñales has had minor surgery but should be recovered and fit for Qatar. The next competitor in line to challenge Viñales would have to be Luis Salom. The Spaniard came closer and closer to the top step of the podium throughout the 2012 season, achieving podiums throughout the year, finally getting a win in the US, before a second in Aragón. He finished the season 2nd behind Cortese after Viñales’ outstanding tantrum in Malaysia. In Jerez last Thursday, the Mallorcan finished top of the leaderboard by over 2 tenths come the final whistle. Although Salom had an extra day than Viñales, given his hand injury. Salom sat in third for the previous tests in Jerez and Valencia, thus he should be putting in a thorough bid for the championship this year; especially with the Ajo team on a full KTM. Behind him at the end of the Jerez test was Alex Rins, of whom finished 5th in the overall standings come Valencia last year, with a singular podium in the washout race at Le Mans. He remains with his faithful Estrella Galicia 0’0 team once again, though this time on the full KTM outfit, rather than the Suter-Honda of last year. Given his pre-season form, where he finished second last time out at Jerez, with the 3rd this time round – one can expect to even see the Spaniard on a dry podium in the opening rounds of the season, perhaps putting in a serious bid for the championship, as well. His team mate, Alex Márquez has also been running well in pre-season, though this is the first time Alex has finished a test in the top 5. The 16 year old brother of HRC prodigy, Marc, has been tipped to be the faster of the 2 brothers and has already competed in a several Moto3 races last year, scoring a best result of 6th at Catalunya. Márquez also, notably, led the final race in 2012 for a short while, before crashing out in the tricky conditions. He has pace, and if commentators are correct and he is the faster of the two brothers, we could well see him on the podium throughout the season. The two Estrella Galicia team mates have both been very fast… but on Spanish circuits, circuits which prior to Moto3, they spent several seasons racing around in CEV. They have seriously good pace, of course, but PaddockChatter has to question whether this kind of form will occur at all circuits throughout the season, or just for one more year – on the Spanish circuits; maybe leading to an all out championship fight in 2014? We will see in Qatar. Miguel Oliviera has been a surprise this off-season. Many have praised his ability since he first appeared on the World Championship stage back in 2011, though he has had limited examples of this shine with just two podiums last season. The Portuguese rider has been a surprise, given that he’s on the Mahindra, a bike which had been plaguing Danny Webb and Marcel Schrötter for the whole of last season, and he has been just outside the top five throughout the official tests. It seems that Mahindra have it right this year, evidenced by Oliviera’s team mate as well, the Basque Efren Vazquez, who has been finishing consistently inside the top ten in the official tests. Could we see the Indian manufacturer get their first podium(s) in 2013? 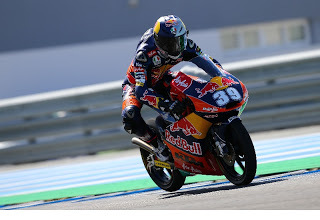 Brad Binder was also impressive at the Andalucian circuit. The South African had a decent preliminary full year on a Kalex-KTM, which saw him score a best of 4th place in that hugely entertaining last corner, slip streaming dash for the line, at the final round. This year, Binder has changed to a Suter-Honda, team mate to Britain’s Danny Webb. Brad finished the initial 2013 Valencia test in 13th, and has since found himself as high as 5th in two of the four days in Jerez. It will be very interesting to see how he will progress throughout the season, and even more so to see a South African flag above a Grand Prix podium again. This is just a scramble of thoughts about the top seven riders in Jerez, there are other riders of whom many expect to be right ‘up there’ again, come lights out time in Doha. However, these riders, such as Fenati, Sissis, Khairuddin et al. have been teetering in and out of the top 10 throughout testing, some may say they’ve been a bit disappointing. But all in all, it’s testing… nothing more, the wheels are not really being turned in anger. We know Fenati, Khairuddin and Sissis can run up the sharp end in a race, heck, Fenati won his second EVER race. The 2012 Moto3 World Championship had viewers on the edge of their seats, spilling Peroni on the carpet and grown men screeching at the top of their voices. This year, there is a possibility of even more podium finishers and an even closer championship fight (provided no-one throws a complete hissy fit before the fireworks go off in Valencia). Roll on Qatar.